The polar vortex appears to be an effect of the cooling taking place as the seasons change. Scientists found that the vortex contains frozen particles of the toxic compound hydrogen cyanide (HCN). "The discovery suggests that the atmosphere of Titan's southern hemisphere is cooling much faster than we expected," said Remco de Kok of Leiden Observatory in the Netherlands. A puzzling detail about the swirling cloud is its altitude, some 200 miles (300 kilometers) above Titan's surface, where scientists thought the temperature was too warm for clouds to form. "We really didn't expect to see such a massive cloud so high in the atmosphere," said de Kok. However, he continued,"The light coming from the polar vortex showed a remarkable difference with respect to other portions of Titan's atmosphere. We could clearly see a signature of frozen HCN molecules." 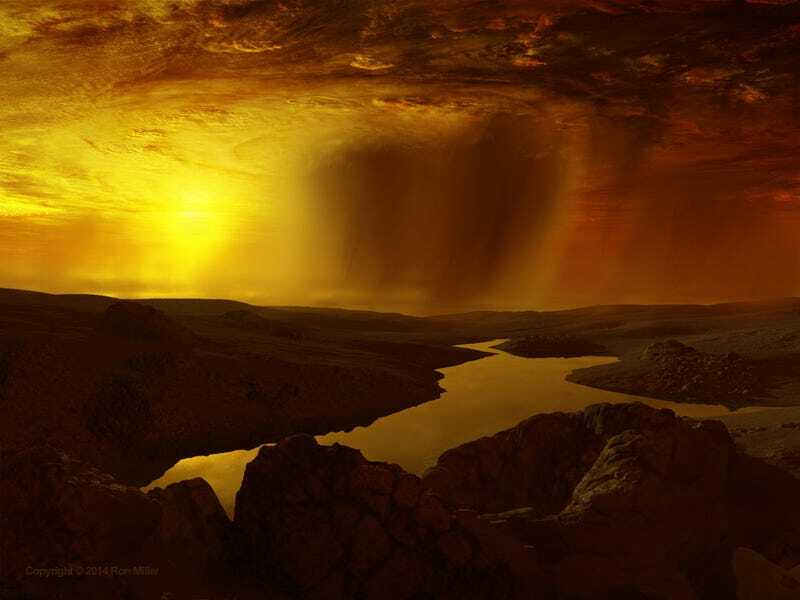 HCN is present as gas in small amounts in the nitrogen-rich atmosphere of Titan. HCN can condense to form frozen particles only if the atmospheric temperature is as cold as –234° F (–148° C). Since this is is about 200° F (100° C) colder than current models of Titan's atmosphere predict, finding these molecules in the form of ice was surprising. Data from Cassini's composite infrared spectrometer (CIRS), which measures atmospheric temperature at different altitudes, showed that the southern hemisphere of Titan has in fact been cooling rapidly, making it possible to reach the temperatures needed to form the giant toxic vortex. HCN gas has become more concentrated at the pole since atmospheric circulation has been drawing large masses of the gas toward the south since the change of season in 2009. Another factor contributing to the cooling is the reduced exposure to sunlight in Titan's southern hemisphere as its winter approaches.